Convenient starter kit contains everything you need to keep a bright, clean griddle. Includes cleaning pads, pad holder, squeegee and Scotch-Brite Quick Clean Griddle Liquid. 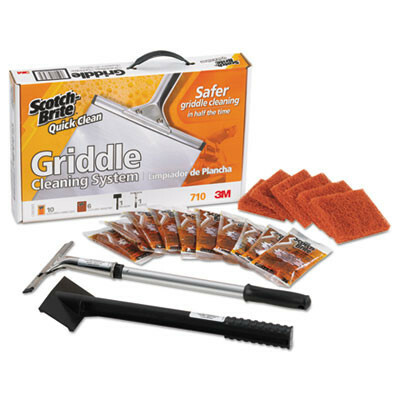 Griddle kit provides a faster, safer and easier solution that traditional griddle cleaning products. An excellent option for busy restaurants with equally busy griddles. Application: Griddles; Applicable Material: Metal; Dirt Types: Dirt; Grease; Grime; Physical Form: Liquid. Customers who were interested in the Scotch-Brite Quick Clean Griddle Cleaning System Starter Kit were also interested in the following items. This is a review for the Scotch-Brite Quick Clean Griddle Cleaning System Starter Kit.